This strenuous climb switchbacks up the mountainside to reward you with two pristine, alpine lakes tucked beneath towering peaks. The trail begins level through the trees in a nice, airy forest. You start to gain elevation with a few great views of the rocky summits, before crossing a creek. The trail now alternates between open hillsides and forest. It turns uphill and steeply follows the ridge straight up until it comes to a junction with the trail that breaks south towards Taggart and Bradley Lakes. Stay right at the junction where the trail begins to switchback up the slope. 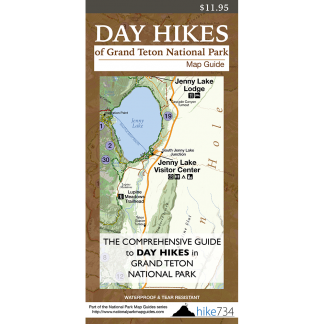 More open hillsides reveal better views down to Taggart and Bradley Lakes as well as views across Jackson Hole. It alternates between open hillsides and forests as it approaches the junction with the Garnet Canyon Trail. Stay right at the junction. The vegetation begins to change to more subalpine fauna such as Whitebark Pine and huckleberry bushes. After numerous switchbacks, the trail levels out and heads into a draw where Surprise Lake comes into view. 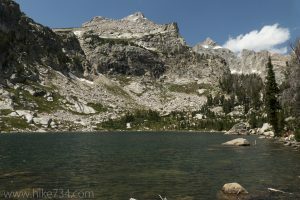 A social trail travels to the south end of the lake to a viewpoint into Garnet Canyon and impressive views towards Grand Teton and surrounding peaks. Head back to the trail to continue on past Surprise Lake for another 0.2mi/.3km to Amphitheater Lake. The beauty of this lake with its dramatic backdrop makes it a popular destination despite the 3,000ft/900m of elevation gain. Enjoy the clear waters nestled beneath towering walls, listening for the pika’s “eep” calls from the boulder fields across the lake.